Dr. Octagon was murdered (twice!). Handsome Boy Modeling School shuttered its doors. Deltron Event II is underground hip-hop’s Detox. What’s a legendary producer to do? Come anew, of course! Dan the Automator‘s latest endeavor is Pillowfight, a hip-pop collaboration with next generation genius Emily Wells. Nathaniel Merriweather’s act hasn’t changed much, yet it remains a consistently impressive breed of familiarity. “Rain” drives the nail into the coffin of a certain nouveau faux-vintage siren’s hype machinery. “You’re So Pretty” is a jangling soul sparkler. “Redemption” gets on plucky tip-toes and still comes out stomping. Both Motown and Nashville inspire “Get Down.” After last year’s confessional Mama, Wells exhales deeply as she slips into the role of enchantress. Her singing is forcefully sultry throughout, like a tap that only flows warm butterscotch. A violin finally materializes at the end of the last track, “Sleeping Dogs,” rightly nudging the uninitiated towards Wells’s solo output. In a nod to Automator’s most famous credit, 2001’s Gorillaz, David Choe‘s stoner-Miyazaki artwork is also a full-fledged member of the group. 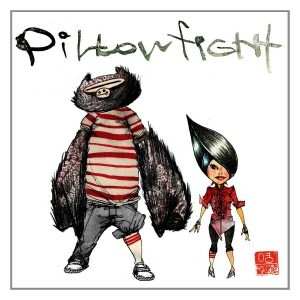 Aided and abetted by DJ Kid Koala and MC Lateef the Truthspeaker, Pillowfight is forty-six minutes of soothing smolder.